Michele Heinz, who plays Sir Andrew Aguecheek. Photo by Shonte Wesson. 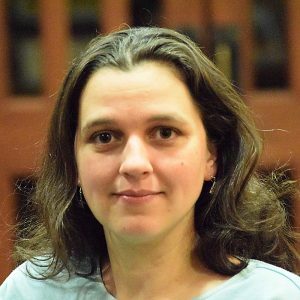 Today we catch up with Michele Heinz, who plays Sir Andrew Aguecheek. 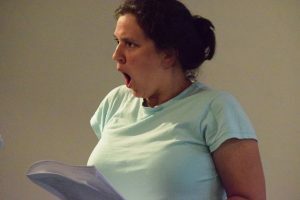 Michele’s first role with the HPCP was the title character in Jean Anouilh’s Antigone; she has also appeared as the Countess in Picasso at the Lapin Agile and Gertrude Chiltern in An Ideal Husband. Q. You were the assistant director for The Marriage of Bette and Boo this season. Do you find that directing has changed your approach to acting? MICHELE: Yes! This is going to sound naive, but I really used to think that if there was something important my character should do, the director would let me know to do it. I saw myself as a game piece – let the director move me and don’t mess up their vision. But so much of the magic of theater is created by tiny moments from each character, things that no one person has the time to organize, things that erupt as people brainstorm and try things on stage. I am experimenting and trying to make moments like that for Sir Andrew. I trust Leslie and Shonte to let me know if I’ve missed the mark. Michele Heinz as Sir Andrew Aguecheek. Photo by Shonte Wesson. Q. What do you think keeps Sir Andrew hanging around in Olivia’s house with Sir Toby and Maria? How do you think he reached the point where this is what he’s doing with his life? MICHELE: In my portrayal of Sir Andrew, he’s just a guy who has always had things come pretty easily to him because of his wealth despite not having many useful skills. He adores Sir Toby and always has fun with him, so he’s pretty content to be drinking and carousing with his friend. Things currently aren’t going his way, but that might change! Sir Andrew is a gullible optimist. Sir Andrew thinks of Sir Toby as the cool big brother. He craves Toby’s affection and approval while also being a little bit competitive with him (Andrew is a bit of a braggart). Sir Toby is an opportunist who takes advantage of that to party with Andrew’s money. It’s a match made in . . . Illyria. Q. The pictures of you, John, and Margaret from rehearsal are always hilarious. Can you tell us a little bit about how the trio developed the physical comedy you obviously have going on? Michele Heinz as Sir Andrew Aguecheek, Margaret Richards as Maria, John Poole as Sir Toby Belch. Photo by Shonte Wesson. MICHELE: From the very first reading John’s energy was explosive, and Margaret’s facial expressions are absurdly hilarious. I am just trying to keep up! We are a pretty creative bunch and have been free to try out any and every big and little idea that we have. Sometimes things snowball and Leslie has deftly reined us in, but a lot of things have clicked. I think it’s the magic of practicing outdoors with the fireflies. 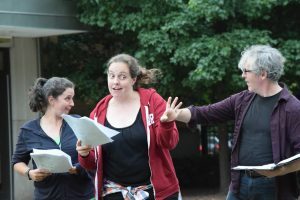 The ‘bigness’ of an outdoor performance has been an asset in ramping up these comedic characters. We don’t have to worry about nuance! Q. You’ve spent some time with the HPCP playing tragic characters. What’s your favorite thing about playing a comic character? An uncharacteristically angsty moment for the trio. 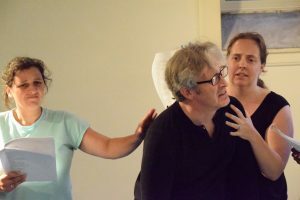 Michele Heinz as Sir Andrew Aguecheek, John Poole as Sir Toby Belch, Margaret Richards as Maria. Photo by Shonte Wesson. MICHELE: After a long scene of looking worried, sad, frustrated, concerned, angry, disgusted, hurt, or afraid my face always hurts. It’s a lot more relaxing to grin! Also, this character has camaraderie with other characters (even if some of it is fake on their parts), and that is a lot of fun, rather than being the character at odds with almost everyone else on stage! Q. If memory serves, this is the first time you’ve been cross-cast in an HPCP show. How much difference does it make to you, as an actor, that you’re playing across the gender divide? MICHELE: Well, I am wearing the Twelfth Night Male Character Uniform, and I try to be conscious not to get too shrill or high pitched when my character is excited. Other than that I’m just playing a flawed person with an enthusiasm for life and trying to do the best I can at it. Q. Is there anything else you’d like people to know about you before we wrap up? MICHELE: I couldn’t possibly be participating in this wonderful endeavor without the help and support of my husband, Dan. We have a 19 month old daughter so we take turns being the ‘active’ participant in HPCP shows. He is an absolute champ when it’s my turn; he is encouraging, patient, understanding, and pitches in on tons of things that fall by the wayside while I play in the park each evening. Thank you Dan!